The Blackhawks have accomplished a lot during the Toews & Kane era. Set franchise win streak record with 9 wins in a row. The Blackhawks became just the seventh team in NHL history to come back to tie an 0-3 deficit in the playoffs. The Blackhawks lost in overtime in game 7 to the Vancouver Canucks. Set franchise win streak record with 10 wins in a row. On October 15, with a win against the Carolina Hurricanes, the Blackhawks celebrated its 2,500th regular season win in franchise history. On January 29, with a win against the Vancouver Canucks, Joel Quenneville reached 693 coaching wins, moving him into sole possession of 3rd place in all-time wins. 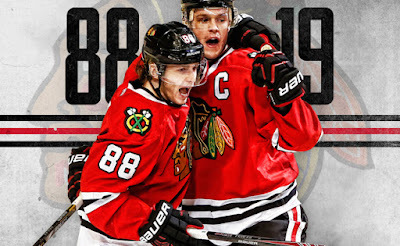 On February 3, the Blackhawks played their 6,000th regular season game in franchise history with a 5–3 win over the Los Angeles Kings. On March 19, with a win against the rival St. Louis Blues, Joel Quenneville reached 700 coaching wins. Keith won Conn Smythe Trophy. He is the ninth defenseman to win the award, and is the first player to win the Conn Smythe and score the Stanley Cup-clinching goal. Keith led every player in the postseason with 31:06 of ice time per game and became the fourth skater in NHL history to log more than 700 minutes in a postseason (715:37). Blackhawks won the Stanley Cup. Set franchise win streak record with 12 wins in a row. Kane recorded a 26-game point streak between October and December, during which he tallied 16 goals and 24 assists. This was the longest streak by any US-born skater, and the longest point-streak in Blackhawks history. Toews set the franchise record with overtime goals (5). Patrick Kane hits the 100 point marker. Only two other players in Blackhawks history have made this accomplishment and both did it twice each; Jeremy Roenick & Stan Mikita.